I rarely think that I have something to offer other preachers and Bible students. I’m the guy who seeks your advice and who simply works in my own field. However, I have developed an organization system over the years that has helped me not only study better, but to document my study in such a way that I can recall it when I need it, and that allows me to be honest and responsible in recalling and citing my sources. It might not work for you, but I have gleaned so much from it that I thought I would share it for any who might benefit. My system is simple enough: It involves folders on my computer and Word documents that I call MASTER FILES. I’ll share my folder system at the end of this article. There are a few things to note about making your own folder system. First, you need to be able to find your information. My thinking and organization might not make any sense to you. For example, all of my material on prayer can be found in Systematic Topics/Worship/Prayer. In my thinking, prayer belongs in the worship folder and not as its own category among other systematic topics. Here’s another example: I have a folder called Ethics in Systematic Topics in which I store (ethical) issues such as abortion, bioethics, cremation, capital punishment, suicide, war, etc. It makes perfect sense to me; but you will certainly need to organize your folders according to how you categorize subjects in your mind. When you read an article or study a subject that you want to save for future reference, then you store it in it’s appropriate location. A second thing to note about folders is that you need to find a balance between having as few folders as possible, but having enough to find exactly what you are looking for. Everything I do can be categorized as one of the following: Bulletin, New Testament, Old Testament, Preaching Admin., Systematic Topics and Working Material (this is material I’m presently working on that is not filed yet). For this reason, I would suggest starting with as few folders as you can, and then organizing within those folders as things begin to get cluttered. 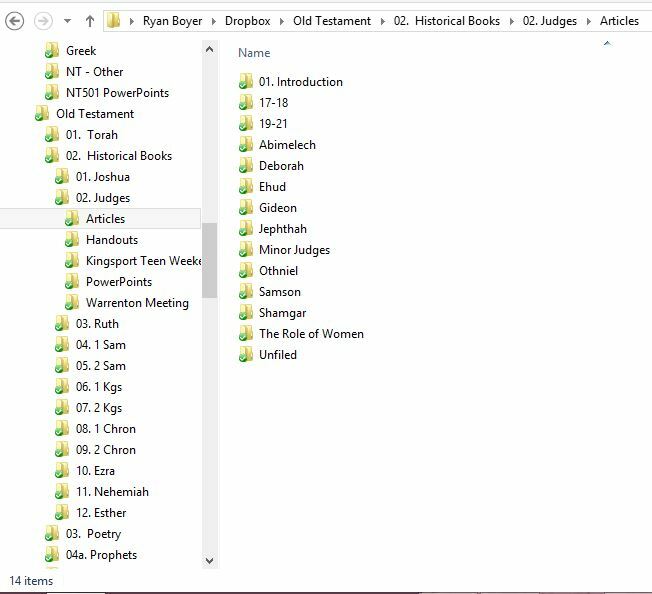 For example, my folder on Judges (OT/Historical Books/Judges) began with almost nothing in it. Through the years, however, it has grown; and this is especially true regarding my pdf articles that I used for research. As my article collection grew and became cluttered, they could naturally be categorized by subject. Often, articles can’t be organized according to subjects, so I organize them according to the text that they address. Romans is a good example of this arrangement. If you are just starting, I would begin by using as few folders as possible without a folder being so crowded that you can’t find what you are looking for. In order to make folders appear in a specific order you will want to begin the name with a number. Think ahead! In books with more than one chapter, use 01, 02, 03, etc. and in Psalms use 001, 002, 003, etc. Here is a MASTER FILE TEMPLATE for you to download. I use my Master File to store all information on individual subjects. The reason for this is because if you are not careful, you will end up with your information spread across 30 different sermon and class files. These files will become hundreds of pages long, but they still allow you to stay organized and all your information will be in one place. I generally only have one file for any book of the Bible, or a major subject such as the Lord’s Supper. 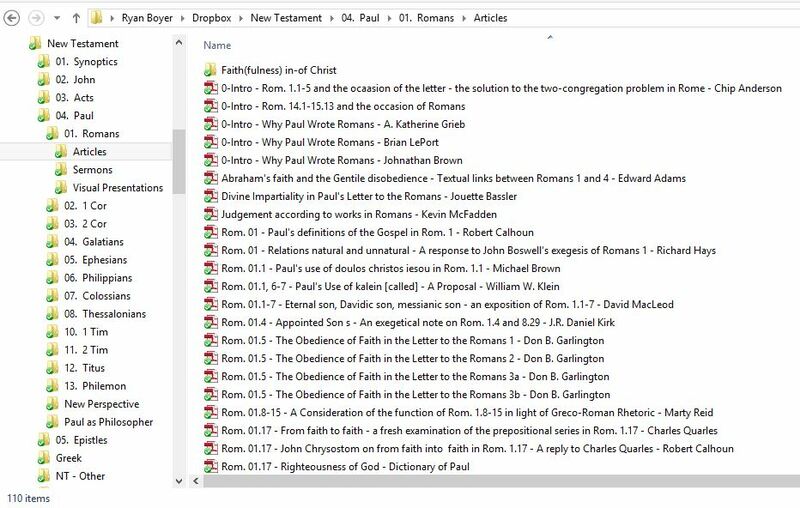 Then, in my folders (from above), among other things, my Master File will be typed in all caps: ROMANS NOTES or LORD’S SUPPER NOTES. There are several elements within the Master File Template that are important that I have learned about the hard way through the years. Hopefully, you can get it right the first time. Subject: This one is pretty obvious. It will be called ROMANS or LORD’S SUPPER. Details: I always document where and when I preach or teach my information, so I don’t repeat it on accident. If the notes under any of the headings are an outline from another’s sermon I liked or found useful, then I document who preached it and where it was preached. Headings: Headings are important because they allow you to navigate your document quickly. In Word, go to View, and in the Show box make sure that Navigation Pane is selected. You will want to used several levels of headings in order to categorize and sub-categorize your material. In other words, this is a way of outlining. One other benefit to using headings is that you are now able to use the Table of Contents feature in Word. Topical studies follow the same general idea, only they are organized according to the major sections of study associated with that subject. For example, I have a folder in Systematic Topics called Bible. Then, within this folder I have other folders called Canon, Inspiration, Interpretation-Hermeneutics (I often give folders multiple names because I know myself. Sometimes I will try to find something by searching for one subject name, like interpretation, and other times I will search by another name, like hermeneutics), OT in the NT, Revelation, Translation, and Transmission. Like most subjects, it is sometimes hard to talk about any one of these categories without also talking about another (e.g. Canon and Transmission are often associated with one another). So, instead of having a Master File for each of these subjects, I have a Master File called THE BIBLE NOTES in my Bible folder along with each of these other categories of study. Then, in my THE BIBLE NOTES file, I have headings for Introduction, Authority & Revelation, Canon (sub-categories: OT, NT, Extra-Canonical Writings), Transmission (OT, NT, Textual Criticism), Translation (Principles, English Versions – another sub-category), Choosing a Bible, Alleged Errors in the Bible, Bibliography. Citing Your Work: You only have to learn this lesson the hard way once: CITE YOUR WORK AS YOU GO! Every one of my Master Files has a Bibliography, which often has 2 sub-headings: Works that are actually cited in this document, and works that I need to find and read later. Trust me – properly cite your work from the get-go and you will be so glad you did later on. In addition to maintaining a dynamic bibliography, use footnotes to cite every single quote you insert into your paper. You can do this in Word by clicking the Reference tab, then Insert Footnote. Cite all your work according to SBL or Chicago/Turabian formats – DO NOT used MLA in Biblical Studies. Do it right as you go! You’ll thank me for this one later. Dynamic Outlines: The template that I have offered you is already set up with dynamic outlining. This is crucial for Master Files because your notes will grow and evolve over time. Dynamic outlines allow you to increase or decrease your indenting levels in major sections, and will save you from having to renumber your bullet points when you add or delete something from your outline. Always make sure that everything you type in your Master File is connected to a dynamic outline bullet. The key to the Master File being useful is to fill it in over a long period of time. When you read an article or book, take the necessary time to either create a Master File for that subject or to insert important quotes (documenting them as you go) under their appropriate headings in your files. At the end of every book I read (without exception), I go back through the book and either type or make a note in the appropriate Master File so the information is accessible when I need it. I know that I won’t remember that quote, or worse, I will remember it and won’t be able to find it, in 6 months or 5 years. On average, I can document an entire book in about one hour. Journal articles take about 30 minutes. I can’t even begin to express how helpful these two things have been for me. You will be able to find what you need when you need it, and since your material will be built on a life time of (documented) study, your material will be richer and deeper. I hope this helps and that you benefit from it as much as I have. NOTE: All my folders are numbered in order to keep them in in order so I can find them quicker.